MLA John Martin reached out to members of the community Saturday for an hour-long Q & A session at Decades on Wellington Ave.
irst off, it has to be said that it's a wonderful gesture Mr. Martin has been reaching out to the community over the last year in order to hear from residents about their issues. A short time into the meeting, Martin made huge blunder and let the cat out of the bag by indicating in no uncertain terms that Ruth and Naomi's expansion plan is a done deal—before it's even gone to council for rezoning. Whoops. The hour zoomed by as Martin fielded questions and discussed hot button issues from drugs and homelessness to seniors medical costs. First up to bat were two residents from Yarrow who have had some dealings with Southern Rail regarding rail crossings. The railway has insisted controlled crossings be installed on their private property to the tune of $250,000 each, no matter if they're shared with neighbours or not. According to the residents, the properties can't be sold until the crossings are in place. As far as timelines go, the crossings must be in place by 2021. It's amazing a company as large as Southern Rail, backed by federal regulations, that stipulate controlled crossings which would force hardships on property owners just because Southern Rail runs trains through. One man's land currently is bordered by 160 acres of industrial properties worth somewhere in the vicinity of $8M to be divided later into smaller plots for easier sales at some point in the future. Apparently, the realtor handling the properties is Cathy Randall. His is not the only property affected by the "regulations". There are others. Exactly how many is not known at this time. A possible guess of why Southern Rail is insisting on controlled crossings is that they're trying to avoid possible lawsuits if an accident should happen. But what kind of accident would occur on private property with no outside access? Martin said that Something like this would have to be handled by three levels of government , adding that they could try contacting Todd Stone, Minister of Transportation. Martin shrugged off the issue saying it was out of his hands and suggested they contact the ALC directly. "Anyone can apply to the ALC to have property designated and restructured as ALR land," he said. "It's a job for the ALC, and when members of the legislative assembly try to stick their noses into something like this, then it gets really messy. There are a lot of concerns about these things and I hear about it all the time," he said. An elderly couple wanted to know why seniors coming to BC are charged $900 in extra fees annually for MSP when no other province in Canada does it. They said they were exasperated with the cost. Martin responded that the fees are a flat rate and that the 12 per cent of medical costs are funded in part by businesses unless on a fixed income. They were also concerned that in order to drive they need annual medical exams that cost $75 up to 75-years-old. Over 75, seniors have to pay $120 and wondered why the discrepancy. "A lot of people over 80 should not be driving," said Martin. "But there is a need for a policy change within the Health Ministry." The couple also raised the issue about the cost associated with walk-in clinics and when they filed a complaint with the Health Ministry they received a $50 cheque from the government. They indicated that the government wants people to get a regular GP rather than use the walk-in clinic. A former realtor admitted he has been struggling with opiate addiction for the last 14-15 years. "There is lots of support for women but not much for men," he explained while questioning the low number of recovery beds available to men. After he got some of his issues off his chest in his therapy chat, he refused to take a Voice business card for whatever reason other than to say he didn't want it. Apparently, the Salvation Army has 30 extreme weather beds available. Martin said he was going to be attending a meeting in Richmond on Sunday regarding affordable housing. Ruth and Naomi's have beds available for a month with three meals a day, but according to the man, there is a charge associated with the stay. "I'm on disability and was charged $150/day for a bed there," he said. "Now I owe over $700." He also questioned what he said was a complete lack of treatment options available to treat men with sexual addictions. "Several have raised the issue," said Martin. Another man wanted to know why wasn't more being done to stop welfare abuse such as home visits that were common practices in years gone by. Martin indicated that police investigations are costly and the government is always looking at other ways. "You're preaching to the choir said," said Martin. "A lot of fraud cases have been taken out of the government's hands and handled by outside sources." It was a lot to digest over the course of hour, but he got the job done. 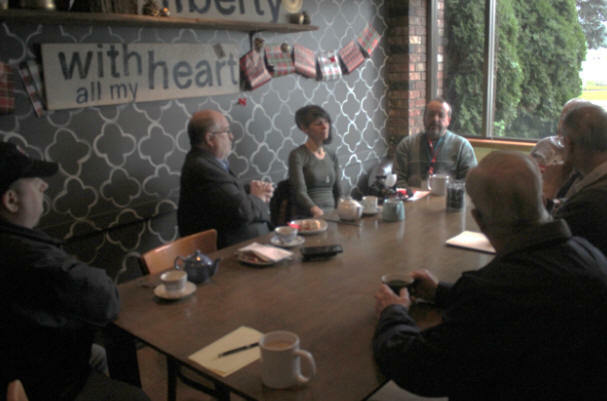 Even if some of the questions and comments were above Martins ability to do anything about for his constituents, he can't be faulted for his willingness to get down and dirty with residents on a casual basis over a cup of coffee. Connect with MLA Martin by visiting his website at www.johnmartinmla.ca or via email here.